A sympathetic portrait of straight white men ends up one-note. Patrick Maley reviews. In Young Jean Lee’s Straight White Men boys will be boys. They will make fart jokes, and they will wrestle; they will affectionately call each other by insulting nicknames, drink too much, and eat like slobs. But for the most part—and here is the surprising bit in a world where the privileged, oppressive ethos of straight white maleness might finally be losing a bit of steam—they will not be obtuse and bigoted. For the most part, these particular straight white men are aware of their privilege, and make some efforts to attenuate it. The grownup products of a deceased mother who taught her sons all about the deleterious effects of white male privilege, the three men at the center of this play are by no means some uber-enlightened cohort of progressive activists, but they ain’t so bad either. Straight White Men turns out to be a mostly sympathetic portrait of the men at its center who are negotiating the reality of their privilege with varying degrees of success. All except for Matt (Paul Schneider): Matt’s struggling. Matt’s existential challenge as a straight white man who wants to be useful in a world where he can’t help but recognize the oppressive nature of his own privilege emerges as the play’s centerpiece. His conundrum and the family problems it generates provide at the very least a provocative and unique insight on the condition of self-aware white maleness. Still, even at 90 minutes, the play feels one-note, and bloated. It contains a compelling nugget of a central idea, but struggles to express it without a great deal of wheel-spinning energy. It’s Christmas Eve and Jake (Josh Charles) and Drew (Armie Hammer) have returned to their childhood home where their brother Matt lives with their elderly father, Ed (Stephen Payne). Jake is the only brother with children, but he is recently divorced and the kids are with their mother, so this Christmas is an all-dude affair. The brothers fall right back into their childhood rhythms of jokes and games, and everybody seems to be having a great time until Matt breaks abruptly into tears. The cause and degree of Matt’s sadness become the focal point of the holiday gathering. In a world of privilege, Matt is Bartleby, a condition with which Lee invites us to wrestle, scrutinizing our own understandings of privilege, its expectations, reach, and effects. 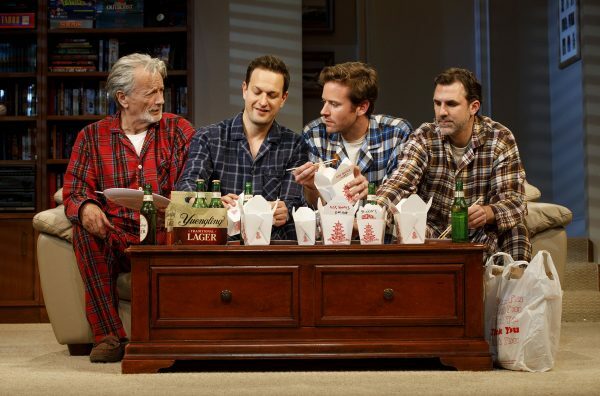 The playwright supports this inquiry by constructing the play inventively as a frame, situating theater patrons as field researchers invited to study straight white men in their natural habitat (this is nicely captured by Todd Rosenthal’s living room set surrounded by a literal picture frame labeled “Straight White Men”). Lee deepens the frame conceit by introducing two non-binary performers (Kate Bornstein and Ty Defoe, credited as “Person in Charge 1” and “Person in Charge 2”) who offer a prologue and reappear at intervals throughout the play guiding the actors to their places. “In case you were wondering, neither of us is a straight white man,” announces Bornstein at the opening. The effect complicates and rounds out the play’s presentation of these four men: the research subject “straight white man,” so often obliviously treated as a default norm in our society, shifts into the place of cultural curiosity. It is a fine move of unique dramaturgy that adds a usefully compelling layer to an otherwise flat script. As long as we remember the frame structure and willingly consider these men empathetically as objects of cultural study, Drew’s tone-deaf proselytizing about the virtues of therapy become less insufferable, and Jake’s overbearingness less grating. But the frame can rescue only so much, and one good insight can carry even a short play only so far. All four central actors comport themselves fine under Anna D. Shapiro’s direction: these characters are not overly complex, but Shapiro and company succeed in finding the core of what makes them tick. Ultimately, Straight White Men finds solid intellectual ground on which to stand, but struggles to sustain absorbing drama in the space around that foundation.